Luxury property with panoramic views of the sea. From every room you can see the sea, the Elba Island, with a beautiful view from the port of Punta Ala to Piombino and beyond. The sun makes on the sea a golden mirror and sunsets visible from this location are unforgettable. The location is lovely, quiet but not isolated, truly unique. The strategic location allows you to enjoy the peace and quiet of the Tuscan countryside without giving up all the amenities and the proximity of the sea and the beach. The short access road is private. The sea and the center with all the facilities are reachable in 2 minutes. Next to the private entrance there are reserved parking spaces. 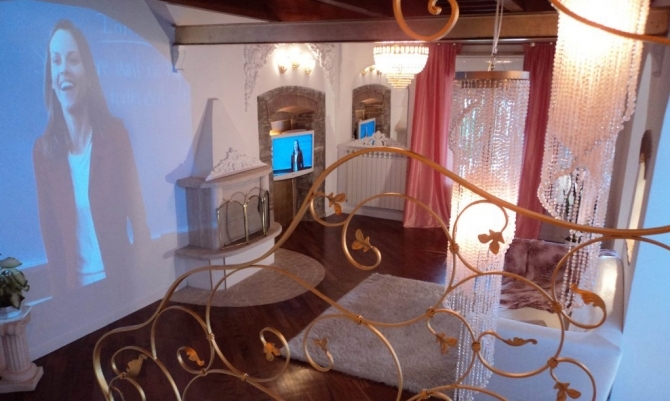 The property has has been recently restructured , with luxury materials and finish. All floors are realized with first choice parquet Doussiè of Africa (mm. 140/70/450) installed on insulating material with the substrate hygrometric percentage of 0.6% with woods without toxic materials and toxic glues, and was created trough the recommendation of the owner. The parquet was glued and not simply placed on a mat. The new floor was built with a main beams of laminated wood topped by a larch wood strucutre with thickness of cm. 3.5. On top of this structure was made a cast concrete structural with thIckness of 5 cm. And the subsequent laying of the floor. In the hall there is an home theater – 3D, connected with Dvd system, dvx, Wifi tv, internet, and a relative home audio surround that reaches every room and the garden, with Bose speakers covered by wood finishes douglas. The entire system is realized with cables hidden in dedicated spaces inside the wall. The wall projection does not include retractable screens. The wall has been plastered with bicomponent material to reflect the brightness and the color of the projection. The size of the projection ‘of 3.10 m X 2 m. 4000 ansi lumens and a contrast ratio of 3000:1 makes movies visible even in full daylight. The finishes are crafted in gold leaf, stucco decorations are hand crafted and hand finished in every detail. The staircase to the upper floor is made of wood and lacquered douglas finished in white, the railing is made of wrought iron craft with leaves of three dimensions. The fireplace has a chimney clam with new structure and travertine finishes. In the dining room the lighting was enhanced by 58 leds that create an unique atmosphere comparable to the starlight. In the bathroom the plaster was made with Venetian plaster, all particular and finiture are realized in travertine, physicians are in travertine with a lion’s head and all taps are Zazzeri, with brass finish. The shower in the master bedroom is trimmed with multicolored mosaic 10×10 with gold details. The walls are made with an average width of 53cm. For an excellent acoustic and thermal insulation. – The hydraulic system has been completely renewed using pipes and multi-layer polypropylene Amut in accordance with law. – The electrical system has been totally renewed in accordance with the law with electrical panels and breakers for each separate environment and emergency lights. There is also an anti-theft system Hesa ? ?dual technology with wireless sensors, sirens and dialer connected to law enforcement. – The heating system is new with 2 solenoid valves to separate the ground floor from the upper one. There is an air conditioning system with heat pumps and air conditioning Daikin Inverter Energy Saving with timer and separate settings for each environment, energy class aa, moisture control in both cooling and heating mode. – The irrigation system is new, independent, with weekly timer, totally made of multilayer pipes and valves for three separate areas. The plant is fed from an artesian well with quartzite filter and its compliance. The well water has certified analysis and can be used for cooking food. In the garden there is also the provision of hot / cold water and drain to the installation of a swimming pool. – The roofs were renewed in 2008, with double waterproofed sheath sealed and insulated internally and externally with expanded polystyrene. There are all the compliance in accordance with law. – Connection adsl and satellite dish placed in the garden disappeared. The systems are already fixed for possible future division into two units.Spaces: This is the arrangement of space, designed and built with the best care, for a total of 8 compartments. First floor: 2 bedrooms, 2 bathrooms with shower, terrace; Second floor: large attic room with electricity. It can be used as 3rd bedroom or gym / spa. 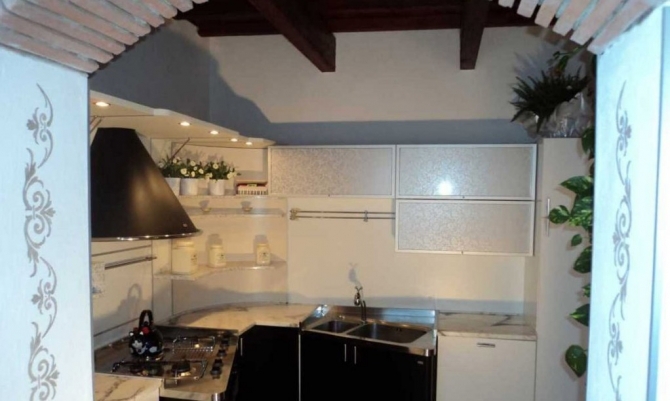 There is also a garage of 15 sqm and storage of 5 square meters with drinking and well water. The property is surrounded by a beautiful park with secular trees, palms, cypresses, oaks … There is also a barbecue with marble floors and a separate oven for pizza. Surrounded by greenery and tranquility, the property is truly unique and finished with the best care and attention to detail.